It is very easy to disable the expand and view of the zip-folders (files) in Q-Dir Tree-View! Q-DIR - FAQ-79: How to, turn off view the zip files in the tree-view, (disable, show, folder)? Please disable the "column highlighting" for List-View of the Q-Dir Explorer "Menu" ► "Extras" ► "List-View" ► "Disable column highlighting eg. sort-column"
Under windows 7, when i select a color design, the first column remains white? 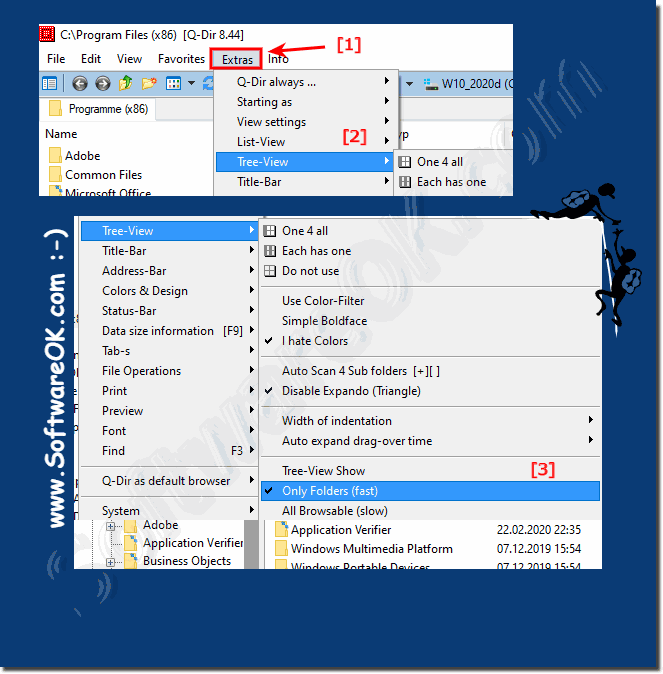 Works the Q-Explorer Q-Dir in Windows 8? Change the default action of pressing WIN+E to start Q-Dir and not explorer.exe on Windows 7 and Windows 8? Why do some file/folder sizes have underline? I would like to disable!